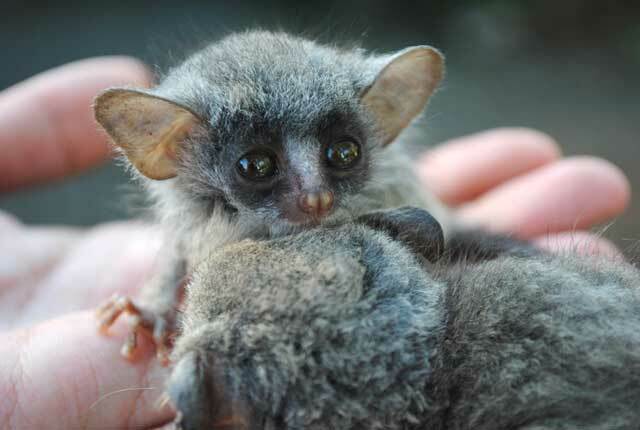 Tammy and Tommy started out life a little differently, from the usual lesser bushbaby, lesser because they have distant cousins who are the greater bushbabies. 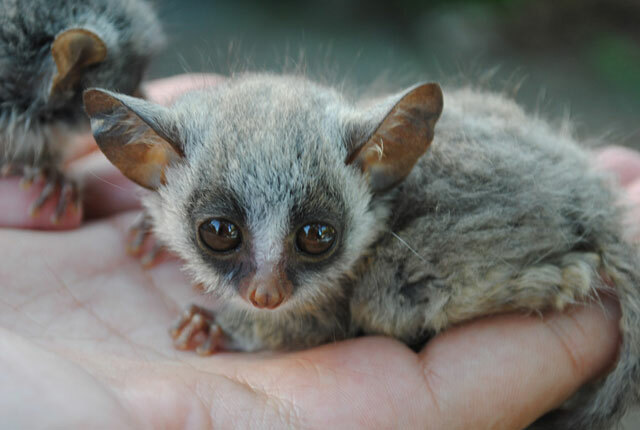 These greater bushbabies are enemies of the lesser – as in territorial. They were also hand reared by two different surrogate couples. 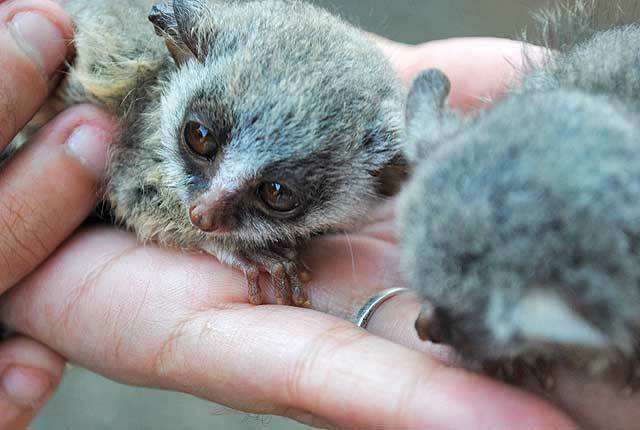 The first bushbaby couple were transferred to a new location. The second couple raised them to full size and let them go into the wild as soon as they were ready to look after themselves. 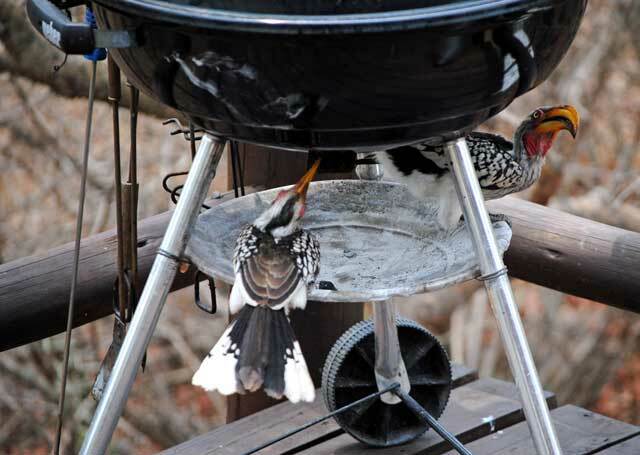 Although with these two, this did not mean fighting for food because they have never gone far from the house they were raised at. Always looking to their surrogate parents for protection. So food has always been on tap for them, as well as their regular bushbaby tucker they instinctively find and know about. They are still going about their regular lifestyle in the wild, from day to day as normal bushbabies, except for the food on tap if they like. Here at four weeks old in these photo’s. This is the smaller and shy Tommy in the other hand. Tammy in front and Tommy looking away. Two babies in one small hand. 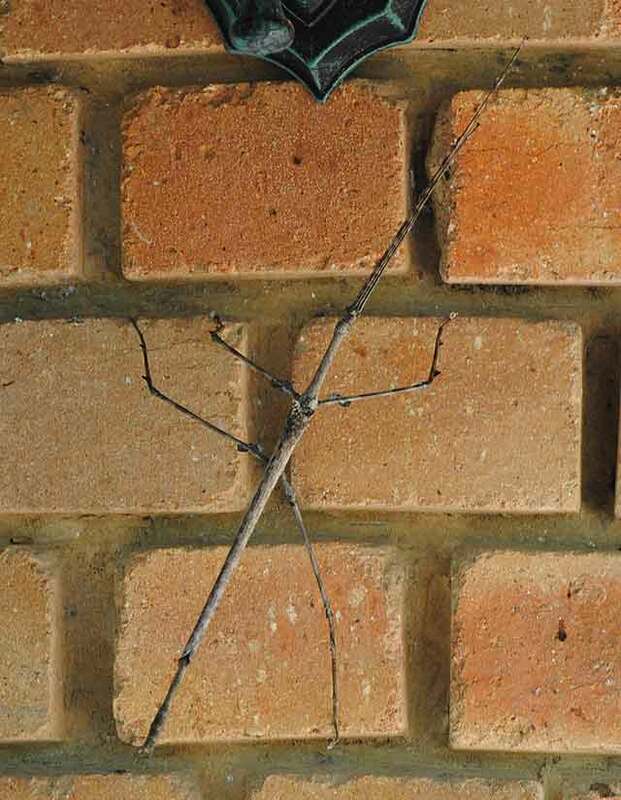 I believe this to be the largest stick insect found in the Bushveld. In case you were not aware, they fly and fly very well. 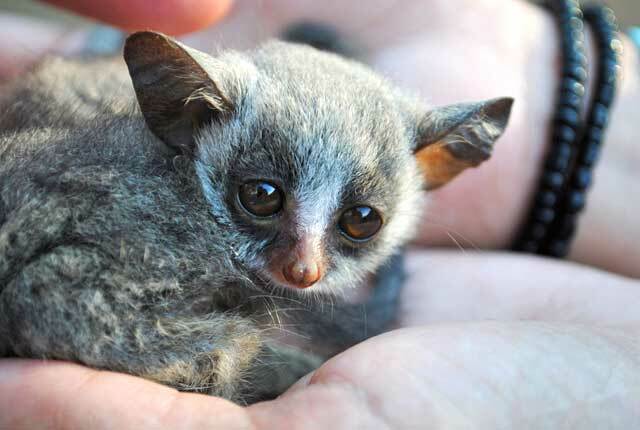 If you ever get a chance to see one of them fly, ask a bushbaby, – who eat them – you will be fortunate to see the amazing colour and wing structure, which are striped vertically and horizontally in iridescent purple, blue, grey and silver. How it keeps such a large wing span under such a small space is a real marvel and a mystery to me. This one did fly when I persisted in taking close-up pics of it, but it moved so fast, I never managed to adjust focus and get it in flight. But I hope you enjoy these images, which I consider myself fortunate to have gotten. 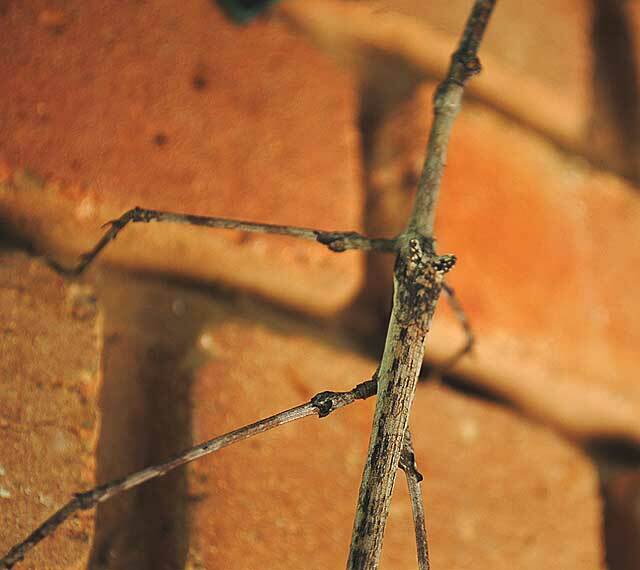 Read the captions and see how this amazing creature is structured. 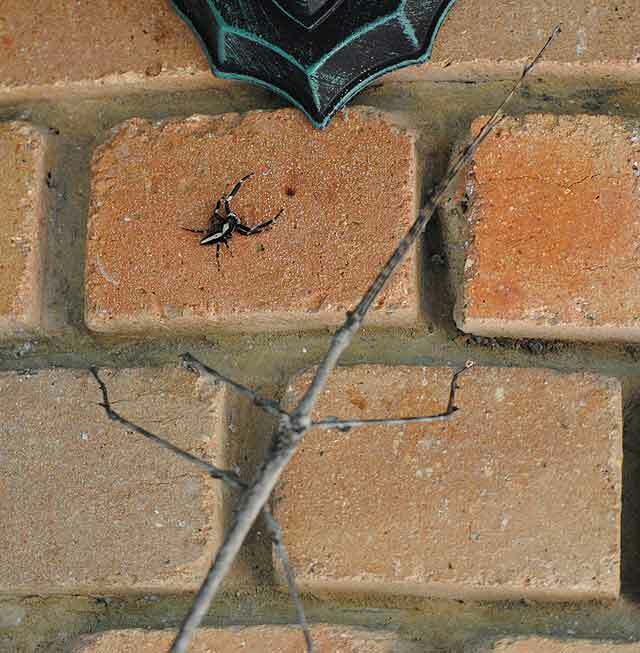 The spider in the one pic is a fairly common hunting spider here in the bush and I am sure it thought this thing above it was a stick Boeing for sure. 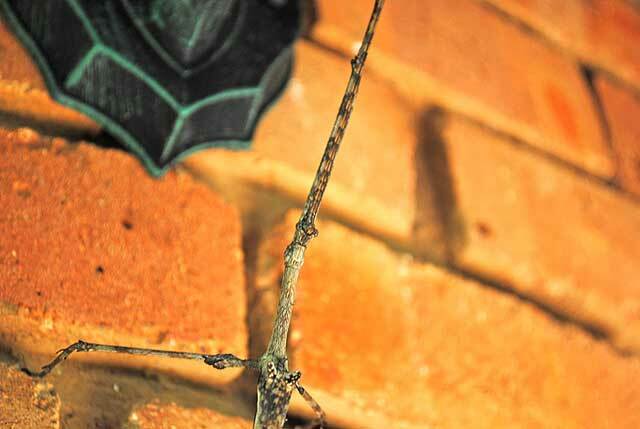 Its size can be measured by the height of the bricks, which are 3 inches tall. By my calculations I get it at about 8 to 9 inches long from head to tail and taller than a bushbaby. 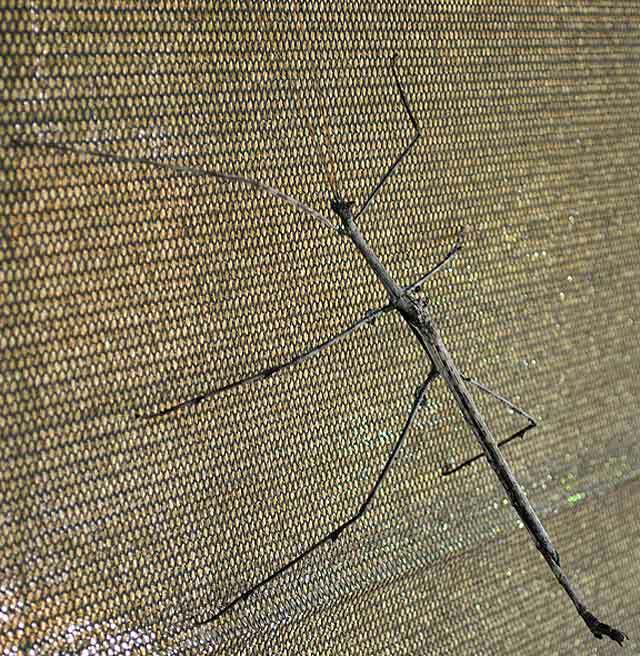 For interest, the longest ever recorded was 10 inches (25cm) making it the longest stick insect in the world (so this one’s pretty close). If this thing ever lands on your head, as one did to me one night, you will know you have been set upon by a bigger than usual insect. 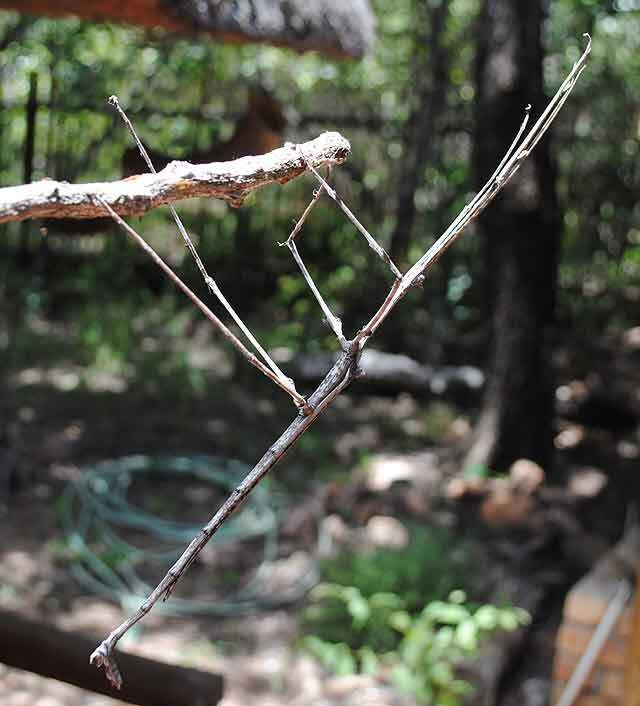 The stick insect over a spider with front legs pointing forward. The Bricks Are in Good Focus. Had auto focus on by mistake. Better focus of the hinges to the wing thing. Eyes a brick up. Eyes above legs pointing forward, with wings below. Legs still pointing forward. Look closely for the wing covering. Standing on all six for the first time, after flying here. Hup Two Three Four… etc. 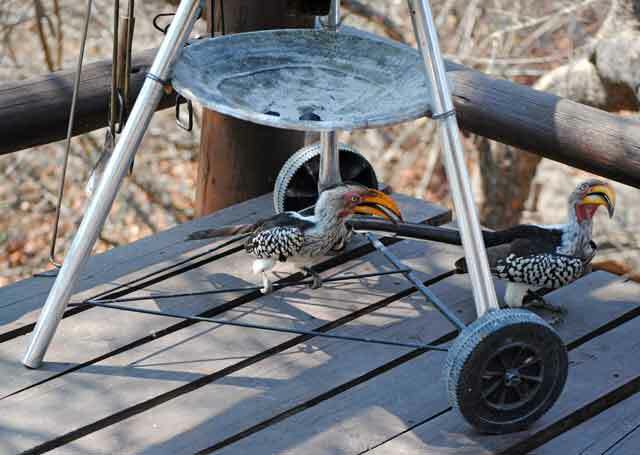 Like the bushbaby, some things are a legend in the Bushveld because of their unusual behavior. 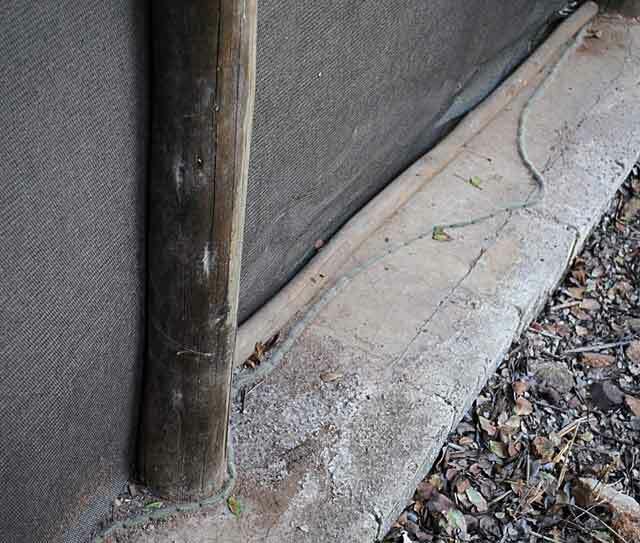 This is a piece about processionary worms, which fit together with the fascination of the dung beetle. 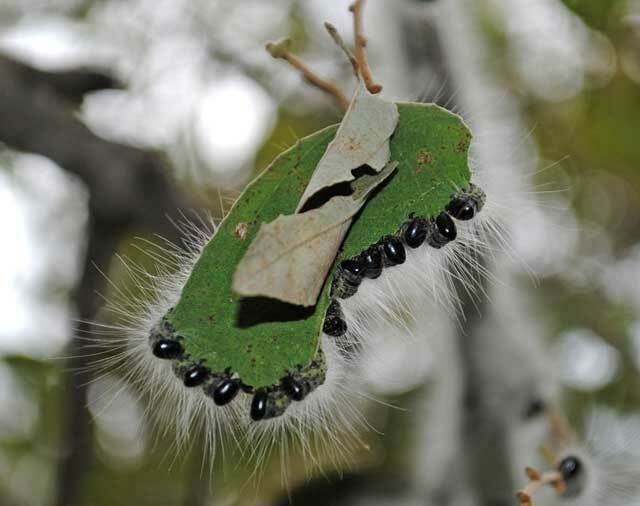 At the start they are eggs, like eggs, except these make scarring distortions on the leaves until they are ready to hatch. 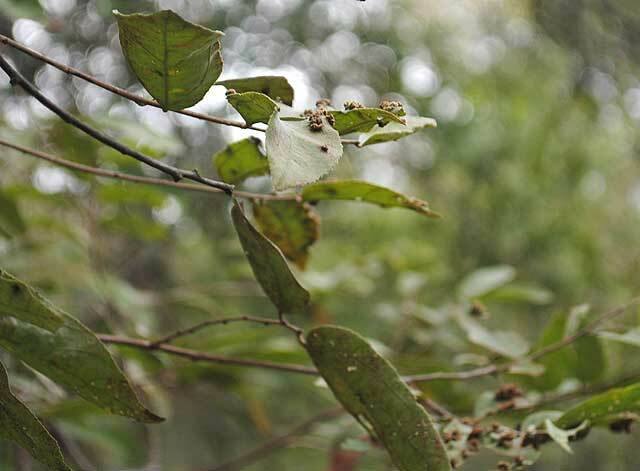 After hatching, the worms host off the plant they are born on, as you will see from the pics. 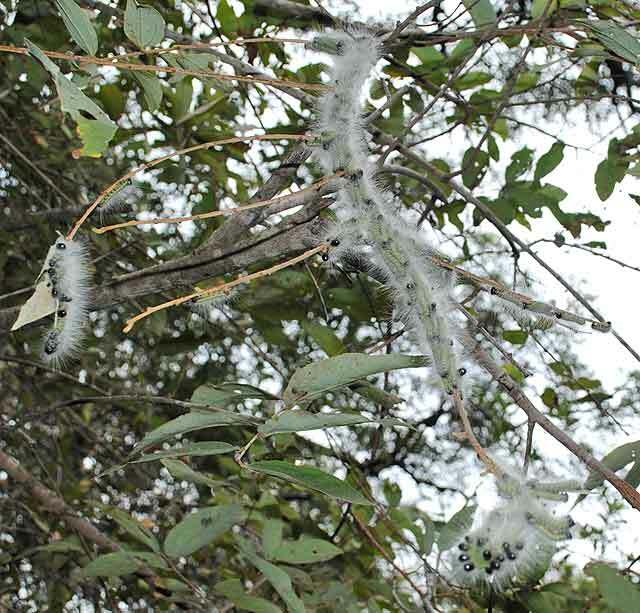 These worms are amusing to watch, once you relax and get used to the fact that nature is eating a bush you might like. When they are fully grown they simply get together in separate parties and march off across the Bushveld, or your yard as in our case. Where to? Well anywhere and everywhere. 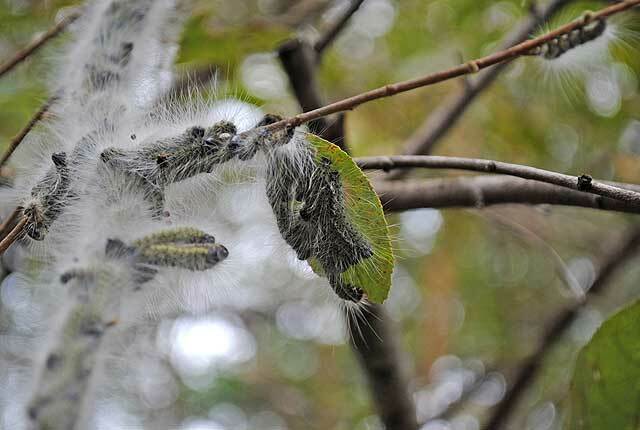 For weeks until they settle somewhere to make a cocoon – separately of course, – turn into a moth and start the cycle all over again. What else? Are they attached or not? Well not attached. These guys/dolls simply keep in procession by following one another. Why, you may ask! I think they keep in procession to fool predators into thinking they are a snake, or very long worm, or maybe it’s a case of. “We maybe small but count us!” “Steal my brother and we hang on.” But then I am not an expert. Well the books tell me those are the reasons to fool predators like cuckoos, their main enemy. Eggs like all eggs, will hatch. These are processionary worm eggs. Oops! Missed a leaf here. Hey! Cousin left this leaf for us few. They that eat together, stick together. The glow is on. 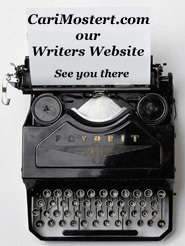 We are moving… Together! Boy they sure nailed that log. This way Harry. 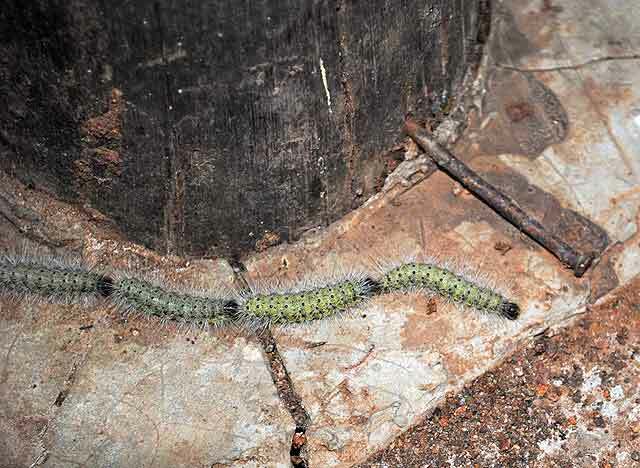 I said processionary. Not straight line. That’s another bug. See our story on Stooky and Lil for a little background on these two hombres. Photo’s taken under the Weber barbeque (braai). There’s a whole series of photo’s we’ll bring of these two, plus the antics they get up too. Couldn’t resist adding them here, after going over them the other day. 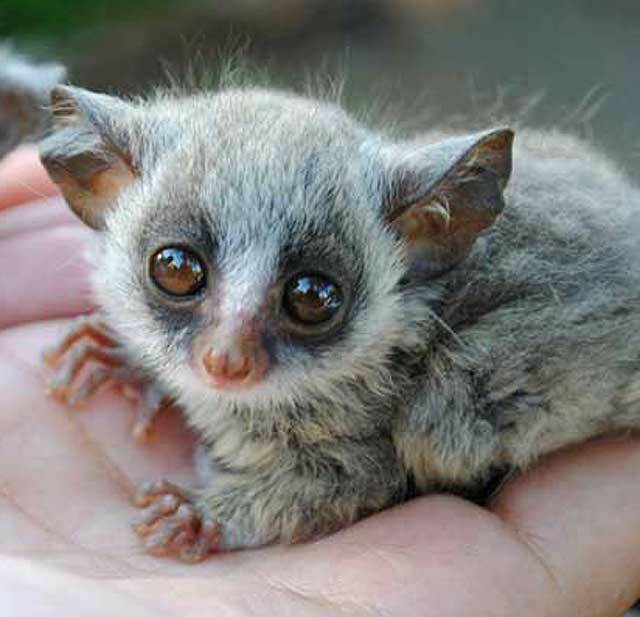 Bushbabies never get to see birds much because they’re nocturnal – umm.. no, not the birds.